Michael Franti & Spearhead perform Saturday at Pier Six Pavilion. Before the concert, Franti will lead a mass yoga session. Singer Michael Franti vividly remembers the first time he took up yoga. It was nine years ago, the week after 9/11, and Franti needed a way to help cope with the tragedy. "Like everybody else, I was sad and worried about the world, and angry and hurt," he said. "I had so many emotions. Somebody said, 'You should try yoga; it's a great way to get into your body and let go of a lot of stuff.' "
Franti found a yoga teacher, who led Franti and his bandmates through a class. Franti was the only one who stuck with it; he still does yoga every day he's on tour and tries to share it with as many people as possible. Hours before his show at Pier Six Pavilion on Saturday, Franti is leading a free mass yoga session at the grassy amphitheater, encouraging concert patrons to come early with yoga mats. Though Franti has led mass yoga sessions before at his annual festival, this is the first time he's done it while on tour, he said. The session will probably run about an hour and a half. "It's fun and inspiring to see a lot of other people working hard around you on a yoga mat," he said. "You get this feeling like, 'Wow, I can go beyond where I thought I was before, because there are so many other people here who are putting the same effort into it I am.' 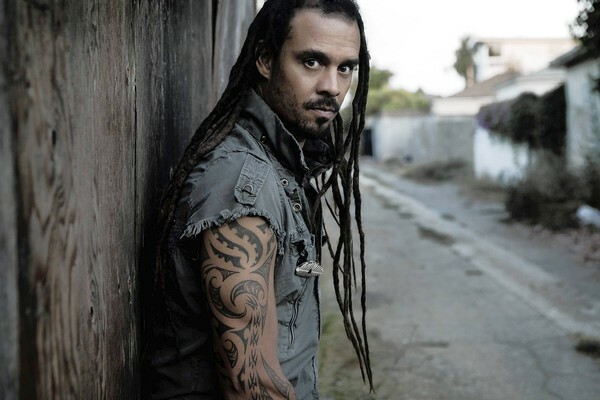 "
Franti, 44, has spent most of his musical career outside of the mainstream. He cut his teeth as an underground performer in the West Coast punk group the Beatnigs in the 1980s and was a member of The Disposable Heroes of Hiphoprisy before forming Spearhead in 1994. Though Spearhead's first four albums were picked up by alternative and college radio stations, they didn't crack the charts. The band's 2006 album "Yell Fire!" peaked at No. 125, but the group finally got some mainstream love with its last effort, "All Rebel Rockers," which debuted in the Top 40. "All Rebel Rockers" was out for about nine months when pop radio stations picked up on the single "Say Hey (I Love You)." The song rocketed into the Top 20, giving Franti his first pop hit at the age of 43. The same week, Franti's appendix ruptured, and he almost died, he said. "I remember being wheeled into the operating room, and the doctor was like, 'Hey, I hear you got a song in the Top 20,' " he said. "I was like, 'Yeah, I have a song finally on the radio, and I'm not going to live to hear it.' He was like, 'Don't worry, we're going to get you out of here.' "
While he was recovering in his hospital bed, Franti would stare out the window, hoping for sunshine. The thought inspired him to write "Sound of Sunshine," the title track to Spearhead's next album. Many of the songs on the record are about friendship and acceptance — familiar turf for Franti, who has a host of songs with positive themes. He's seeing the world with fresh eyes after his surgery, he said, but the feeling he gets from playing has remained constant. "After 20 years of making music, I still feel the same way I did when I first started," he said. "Every time I get on stage, every time I play on the street, pick up a guitar and write a song, I get this thrill, this charge from it. That's always been there. That's really what I do it for."